Gone are the days when the ordinary mouses were used for the gameplays. The current trend is the use of Gaming Mouse which has become an important component for a PC gamer. Gaming mouses differ from the ordinary mice in various aspects. While a normal mouse does not emphasize much on precision and sensitivity, these are the main factors of a Gaming Mouse. The precise mouse movements play an important role in games where minute differences in the response time will have a huge impact on winning or losing the game. The market is flooded with a lot of gaming mouses with different features in them. Given that, the right selection of a gaming mouse matters a lot. This article puts some light on some of the five best gaming mouses in this year that have been performing well among its current users. Before discussing on the best gaming mice, it is important to understand various factors that decide the quality of the gaming mouse. 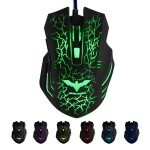 A good gaming mouse takes into account various factors connected with a gameplay like precision, speed, sensitivity, etc. This is the foremost thing to check before selecting a gaming mouse. While some of the best mice are available in wireless mode, it is no harm in choosing a wired gaming mouse. This is because some wireless gaming mouses tend to show some lag in milliseconds that might affect a fast-paced gameplays. But it is not to be ignored that wireless mice are more portable and convenient to use. This is the most important factor that decides the standard of a gaming mouse. Dots Per Inch or DPI refers to the movement of the cursor in pixels with the single inch movement of the mouse. This needs to be extremely high for a gaming mouse especially for the fast gameplays. The sensitivity of a gaming mouse is also defined in IPS referred as Inches Per Second. This refers to the speed the mouse moves before losing its track on the screen. A good mousing offers optimal grip for the gamer. The important grip positions are at your palm, claw and fingertips while using a gaming mouse. The best gaming mice offer precision grips for the gamer so that he/she can have better control over the game. The more compact the gaming mouse is, the more comfortable a gamer will feel. If you are a game addict, this is one important factor to check. The compact size of the gaming mouse will comfortably fit within your hands and it will make you less burdened while the long game plays. In many games, the weight of the gaming mouse plays an essential role. A mouse that is slightly heavier will favor you in some of the shooting or sniping games. The placement of a heavier mouse is more stabilized than that of a light weighing mouse. The gaming mouses use either optical or laser technology to track the mouse movements. The surface compatibility of an optical mouse is limited when compared to that of a laser mouse. A laser mouse can be used on various surfaces, unlike the optical ones which can be used only on opaque surfaces. The DPI is much higher in the case of laser mice when compared to the optical mice. The Logitech G900 has various advantageous features which every gamer will expect. The Chaos spectrum offers extremely accurate tracking and superior responsiveness. It has the ability to track every single movement of the hand and respond accordingly on the screen. The wireless mode can work up to 30 hours without any need to be wired, thanks to the clock tuning technology it employs. 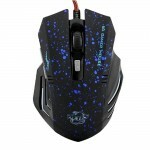 The mouse offers a smooth and constant game session with the adaptable sensitivity. Not every game demands the same DPI value. You can always adjust the DPI value that works well with the game. The mouse is designed to be comfortable for both the right-handed and the left-handed gamers. The pivoted design of the buttons ensures accurate and fast click performance. The mouse is designed to be compatible with the latest versions of Windows, Windows 8, and Windows 7. The mouse is lag-free and comes in both wired/wireless mode. The “Clock-Tuning” Technology offers the extended battery life of about 30 hours. The tracking accuracy is delivered with the PMW3366 optical gaming sensor. The sensitivity is adjustable with a wide range of DPI from 200 to 12,000. The button layout is customizable and has an ambidextrous design. The sensor of the mouse is very accurate. The size is compact and provides comfortable positioning. The profile settings can be saved on the mouse. It comes handy even for left-handed persons with removable side buttons. It lacks certain scroll features. The mouse is reported to be uncomfortable for short-handed palm users. Summary: If you are looking for an extremely reliable gaming mouse with more accuracy, Logitech G900 is a perfect choice. Though it is expensive, the amazing features it offers justifies the money spent. The consistent performance with the customized buttons enhances its capability to deliver an exciting gaming session. Check Logitech G900 now from Amazon! The mouse from ROCCAT Nyth is the specially designed gaming mouse for the MMO and FPS games. It has a high sensitivity to offer for a smooth gameplay. The printed catalog of the mouse buttons and side parts are available in the 3D format. This helps in improving the gaming experience of a gamer. Each game demands different button configurations and this gaming mouse enables the gamer to do so. The buttons are customizable by the gamer as per his/her needs. The transformation from MMO to FPS is easy with the ROCCAT’s gaming mouse. The palm grip and the claw grip are swappable on the fly. You can always interchange the grips during your gaming session. This is possible with the two hot swappable grips of the mouse. This mouse has been designed to be compatible with all the future games that might be developed under various platforms. The button is designed to be modular. The side grips are swappable. The mouse uses the next generation system ROCCAT driver. The mouse can be used for various game plays like MMO, FPS, and MOBA. It helps the gamer to place up to twelve mechanically tactile buttons with its modular thumb zone. The mouse has the software called SWARM that facilitates all platforms of gaming. The mouse is comfortable in the hands of the gamer. It comes with carrying case for the spare parts. A wide range of games can be played with this mouse. The mouse is prone to accidental button presses. There are noticeable blips in certain cases. Some bugs present in the software need to be corrected. Summary: The gaming mouse from ROCCAT has various beneficial features. The programmable buttons and optimal side grips offer comfortable game plays for the gamers. The mouse also incorporates the software that makes it more flexible to be used for any games or games that are yet to be developed. Check ROCCAT Nyth now from Amazon! The gaming mouse from Razer Naga has been developed exclusively for the MMO players. The inclusion of 19 buttons in the mouse along with the 12 thumb grid buttons offers wide opportunities for the MMO gamers. The “gaming-grade” technology offers uninterrupted mouse movements. But it does take care of the accuracy and control in the process. The response rate is maintained the same (1 ms) be it wired or wireless. The downtime is zero as the mouse gets charged up even during its use. The mouse comes with Razer Synapse, which is the hardware configurator with online support. This feature helps the gamer to customize and save every detail of the game. This will help the gamer to be connected to the game wherever he/she is. 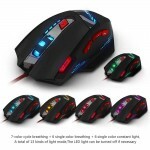 The gaming mouse offers unlimited combinations with 19 MMO programmable buttons. It is designed as wireless with “gaming-grade” technology. The mouse is equipped with the chroma customizable light. The mouse has mechanical thumb grid buttons. It comes with MMO configurator. The Razer Synapse is enabled in this gaming mouse. The laser sensor has better sensitivity. It comes with both wired and wireless capability. The installation steps are easy. The weight and size are optimum to be used. Both sides of the mouse have good grip. The wireless mode has limited working time. Availability of more buttons demands practice from the gamer. Summary: The gaming mouse from Razer Naga offers a plenty of options for the MMO gamers. With 19 buttons to program, what more an MMO player can ask for. The hardware configurator with online support feature will improve the gaming experience of a gamer. Check Razer Naga now from Amazon! The gaming mouse from SteelSeries Laser is designed to give a lag-free performance. It is designed to provide a smooth game even in the wireless mode. The very low response time of about 1 ms eliminates any lag that may arise in the wireless mode. The sensitivity of the mouse is very high and this helps the gamer to increase the CPI value. The mouse can be customized for its lift distance, buttons, and CPI. The battery takes about 20 hours to discharge completely. In the case of low battery level, the mouse can be charged while you play your game. The aluminum base comes illuminated to show the status of battery levels. This illumination can be customized to your favorite look. It comes with double sensitivity. The lift distance is adjustable. The mouse has both wireless and wired connectivity. There are 8 buttons in the mouse that are programmable. The charging base is made of aluminum. It comes handy for both desktop and gaming usages. The control it offers is smooth. The mouse is handy to use. It is prone to the accidental press of side buttons. Summary: The gaming mouse from SteelSeries is designed to be more aesthetic and comfortable. Though it has limited buttons, it comes handy with its iconic shape and size. It provides a reasonable sensitivity and accuracy for the gamers to help them achieve victory. The battery level indication is prompt with this gaming mouse so that the gamer can immediately charge the mouse before complete discharge. Check SteelSeries Laser Mouse now from Amazon! The gaming mouse from Logitech G9X offers some notable features for the game players. You can adjust the grips of the mouse as the gaming needs, between the wide load and the precision grip. The grip needed for the gamer is decided by the game he/she plays. This adjustable grip helps the gamer to perform better in the game. Likewise, the mouse comes with the customized weight-tuning system where you can adjust the weight of the mouse. Like previously discussed, some games demand more weighing mouse, to provide proper stability. This mouse does that by the provision of extra 28 grams that can be adjustable. The onboard memory available in the mouse helps the gamer to save up to five gaming profiles. The profiles can be accessed whenever the gamer plays a particular game among the five. 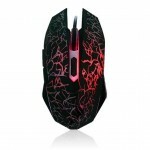 With the changeable LED color, you can customize the looks of the mouse as per your taste. The mouse speed can be changed with the change in the precision. The wide load grip and the precision grip come interchangeable as per the needs. The weight-tuning system offers customizable mouse weight. The mouse facilitates storage of up to five game profiles with additional software. The customizable LED color enables a matching mouse to the PC or the game. It has a high sensitivity range. It comes with the weight-tuning system. Up to five memory profiles can be preprogrammed. The DPI can be changed even during the course of a game. The mouse speed shows sudden changes. Summary: The gaming mouse from Logitech G9X has some of the important features. The adjustable grip provides the necessary comfort for the gamers. The weight-tuning system is something unique which only very few mice offer. The on-board memory within the mouse aids in the storage of game profiles. This avoids the dependence on PC for retrieving the profile of the gamer. Check Logitech G502 now from Amazon! Zelotes 9200 newly arrived in market and built with high technologies. It has optical tracking system with ergonomically designed and made for long-term use. Its DPI resolution is 9200 DPI. This mice specially makes for gaming and it has 8 Buttons. It has Multi-Modes LED lights that makes it gorgeous. This mouse has built with weight iron. So, it will be comfortable to use with stability. You can easily operate this mouse like you can short press to two times click with long press more than 2 seconds to switch triple click and the light flashes 3 times symbolizes effectively changed. This mouse is compatible with all version windows and MAC except windows 10. In this gaming mouse list, this mouse is one of the affordable and cheap gaming mouse that makes your gaming time enjoyable. Check THINKTANK T90 now from Amazon! This gorgeous looking mouse has 1.5 M long wire for long distance use. It’s elegant and ergonomic design will be perfect to match for your PC. It has 6 buttons including Wheel Key, Left and Right Button, Page up, Page down, DPI Switcher. Its DPI resolution is 1000 dpi to 2000 dpi. You have to use the small ‘DPI’ button to switch the resolution. This mouse is compatible for all windows version except windows 8 and 10. For more information check Amazon. Check NiceEshop 6 now from Amazon!